I’ve been eating a bit differently for the past 40ish days. No refined sugar, no flour, no grains, and no dairy. It’s basically been the hardest eating challenge I’ve ever had. I don’t even really eat that much sugar, but by day 5 of eating this way I was craving sugar like crazy. The super sad (mostly great) part about this lifestyle change is I feel better. I LOVE cheese (OMG, cheese), but I may feel better without eating it as much as I used to. Biscuits? Yeah, they’re so good… but flour makes me feel tired. This diet/lifestyle change has meant I need to look at the labels of EVERYthing. It’s surprising how much processed food has sugar added to it. It’s so crazy. Even mayonnaise. 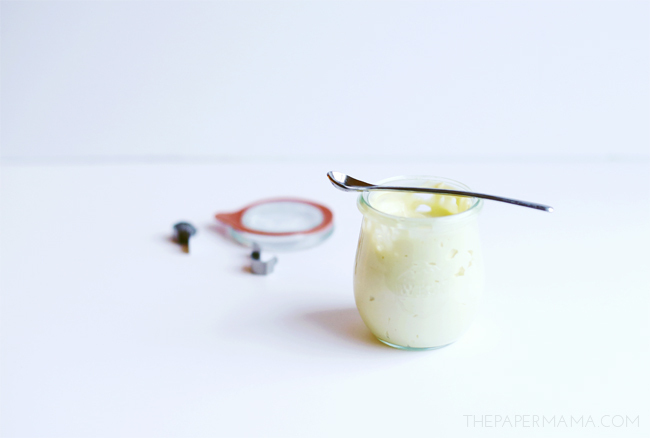 SO, today I’m sharing my homemade mayo recipe that I’ve been making this past month. It’s surprisingly easy, and so tasty. I like to make aioli for my sweet potatoes with this homemade mayo. First, this is important: make sure all the ingredients are at room temperature, that’s important. Place the egg, 1/4 cup of olive oil, mustard powder, and salt into a bowl. Use the stick blender to mix up the ingredients. With the stick blender running, slowly add the remaining olive oil. The key here is to go SLOW. I basically add about an 1/8 of olive oil and mix, then repeat. If you add too fast, it could mess up the mayo. After the mayo is blended and at a mayo consistency, add the lemon juice and mix with a spoon. Seriously give this a try. So good and yummy. A visiting friend made some homemade mayo for us too, very similar recipe. I had never seen it done before, it was lovely and so easy!